Y'all, I cannot believe that Fourth of July weekend will be starting this time next week! I need to get out all my red, white, and blue, and start thinking of my most festive drink recipe - any ideas? 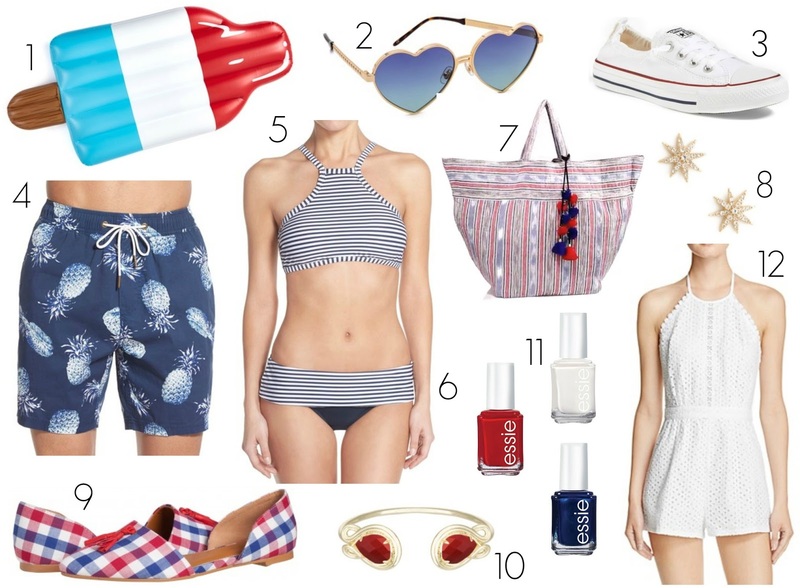 I decided to throw together a few favorite items that I've been loving lately as well as a bunch that I've been eyeing recently and would just so happen to be perfect colors for the Independence Day holiday! On dry land, these Chuck Taylors (oh my gosh, the elastic heels are everything for the summer!!) and a cute romper have been my go-to so far this summer. The back of the white one I'm wishing for is so fantastic - check it out, and it would be so fun to dress it down for a picnic or dress it up for a fireworks party with those Southern Proper flats, star earrings, or bangle! If you're look for even more summer wardrobe inspiration, check out my favorite rompers and off-the-shoulder looks as well as everything floral. Have you started planning your own Fourth of July celebrations? I was going to comment and say I love that bathing suit, but I love everything in this post, haha. I really love those Essie polish colors! The romper & the shoes are super cute too! I love the bathing suit and the romper! Omg those sunglasses are adorable!!! I love my patriotic colors. I adore that bikini and the KS bangle. So cute for 4th of July! I haven't started planning anything yet so I need to get on that. That romper is super cute and I am loving that swimsuit!!! :) Yay for summer! That swimsuit is adorable. I am loving all of the fun pool floats. I cannot wait to head to the beach for the fourth. I just got my gummy bear float in to use for the 4th! And my lil flamingo inflatable koozies -- that's the most important accessory! Love all of your red, white and blue picks, especially that romper!